IDC’s Worldwide Quarterly Mobile Phone Tracker numbers are out and it looks like things have changed quite a bit since we last saw the numbers. As expected, the global shipment volumes for Apple has dropped quite drastically, down by 16.3% compared to the same quarter last year. Samsung’s market share also went down, but by only 0.6%. Companies like Xiaomi and Lenovo (Motorola) have been kicked out of the top 5 chart, and have been replaced by other Chinese mobile phone manufacturers namely Oppo and Vivo, who have grown by a whopping 153.2% and 123.8% respectively. Huawei is standing strong at top five, with a growth of 58.5% compared to last year. According to IDC’s Q1 2016 report, the worldwide smartphone growth has gone flat, going up by a mere 0.2% over the same period last year, the smallest year-on-year growth ever recorded. Despite Oppo and Vivo’s tremendous growth over the past three months, IDC notes that as the Chinese market matures, the demand for smartphones has slowed down dramatically. Of course, despite the drastic change in numbers, Samsung and Apple remain as the top two smartphone manufacturers in the world. The gap between Samsung and Apple has widened and the market share has gone from 24.6% vs. 18.3% in 1Q15, to 24.5% vs. 15.3% in 1Q2016. 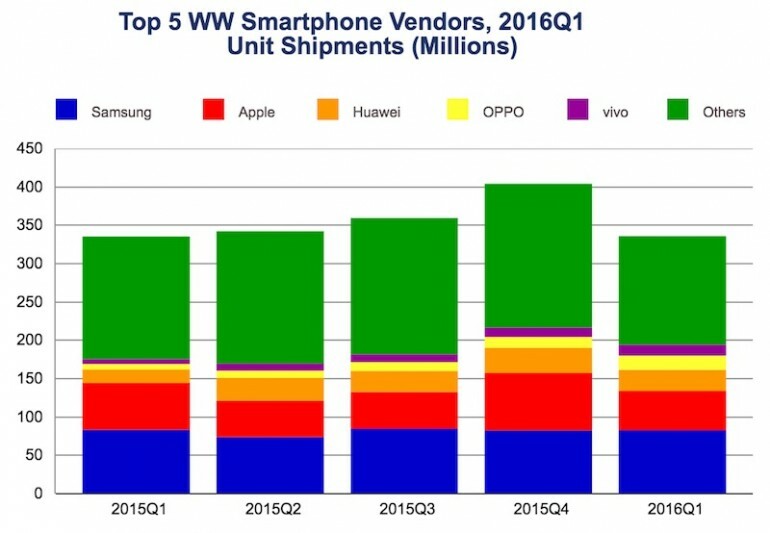 Huawei, Oppo and vivo are placed third, fourth and fifth respectively, with 8.2%, 5.5% and 4.3% market share. 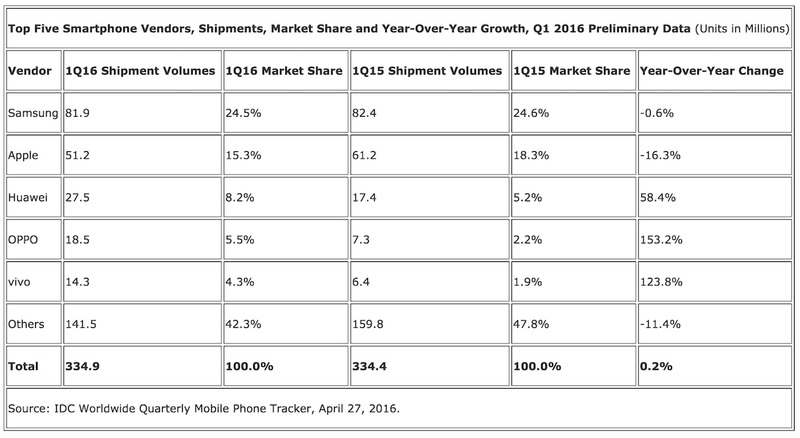 Check out IDC for more information about the latest global smartphone shipment record.